Welcome to the Brown County Brick Lodge. 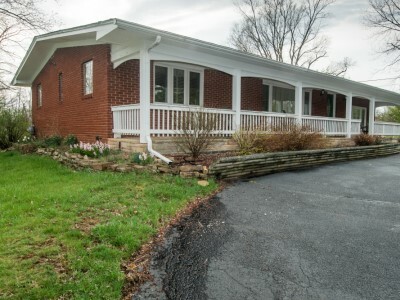 Conveniently located less than a mile from downtown Nashville on SR 135, this home’s knotty pine interior and handsome brick exterior creates a warm, traditional surrounding. Stretch out, relax and watch the world go by from the comfort of the 60-foot long front porch, with six bent wood rockers. 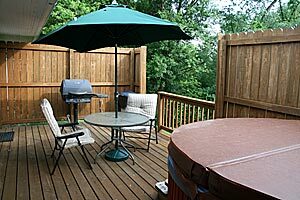 Or if you prefer private luxury, the fenced deck at the rear of the house features a hot tub, gas grill and cozy outside dining area. Keep an eye out for the occasional deer or other wildlife. Inside guests can enjoy the quiet ambiance of the limestone fireplace, play a game of pool, watch a DVD/VHS tape in the spacious living room or enjoy cable TV in any of the comfortable bedrooms. The "Old Hickory" furnishings add to the charm of this quaint lodge. The fully equipped kitchen, two full baths and spacious dining area comfortably accommodates up to eight people for as long as you care to stay. Equipped with modern amenities, this is a wonderful retreat while exploring all the village's 250-plus shops and craft galleries renowned throughout the Midwest. Many artists and craftsman still work from their shops in this historic art colony. The Brick Lodge and nostalgic Nashville will indeed take you back in time...call or email today to reserve the Brick Lodge for your next visit to Nashville, Indiana. North House, our Sister Cabin.